This ETF Talk rounds out the category of the top-performing domestic dividend-paying exchange-traded funds (ETFs) for the first half of 2015 with Cambria Shareholder Yield ETF (SYLD). View the current price, volume, performance and top 10 holdings of SYLD at ETFU.com. This fund’s strategy for selecting companies in which to invest is threefold. SYLD focuses on companies that pay high dividends, repurchase their own shares (thereby driving up share prices by reducing the total number available) and pay down debt to improve their balance sheets. This three-part process results in a carefully selected portfolio of 100 stocks with strong free cash flow. 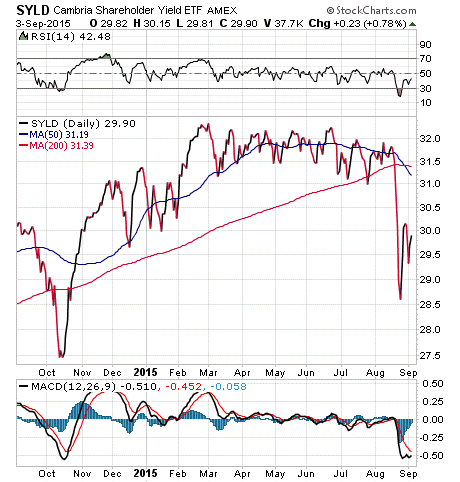 The fund gained 0.32% during the first-half of 2015, after pulling back in Q2. Though SYLD rose only slightly, the first two quarters of 2015 were difficult for the market, and any gain during that time is a show of strength. In addition, this gain does not include its 1.5% annual dividend yield. This relatively new fund, created in 2013, already has about $225 million in assets. As the chart below shows, outside of the large, recent, broad-market dip, this fund’s price has not suffered harsh setbacks. It actually remained fairly stable between March and August when the market slipped. The fund also offers diversification, since just 13.83% of its assets are invested in its top 10 largest positions. Among them are O’Reilly Automotive Inc. (ORLY), 1.60%; CVS Health Corp. (CVS), 1.42%; Reynolds American Inc. (RAI), 1.42%; Lowe’s Companies Inc. (LOW), 1.41%; and Home Depot Inc. (HD), 1.39%. If SYLD’s performance and shareholder-yield-based approach look like a winning combination, you may want to have some shares of Cambria Shareholder Yield ETF (SYLD) in your portfolio. Remember to look for the current price, volume, performance and top 10 holdings of SYLD at ETFU.com. The latest bout of selling in equity markets has been compared to the big drop below the 200-day moving average that occurred in October 2014. While the 2014 breakdown was similar to what’s happened this year in terms of its rapid descent, looking at the big picture, the current decline appears to me to be more like what happened in 2011 than what happened in 2014. The chart below of the S&P 500 index over the past five years tells the story nicely.